Netflix App for iOS No Longer Supports AirPlay… Base on recent tech report, the Netflix app for iPhone and iPad no longer appears to support AirPlay, based on an updated support document found on the Netflix website. According to tech report, some have tried to make use of AirPlay with the Netflix app over the course of the last few days and have run into issues doing so from the Netflix app. 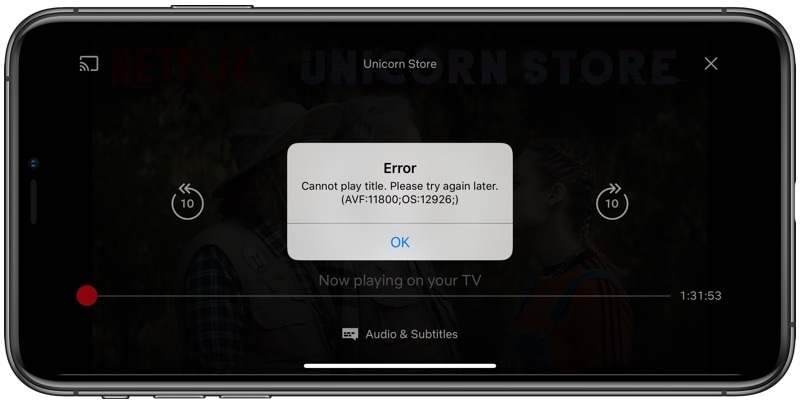 Meanwhile, AirPlay can still be initiated using the Control Center on an iOS device, but when attempting to test the feature, we were unable to get Netflix content to play and received an error message. It’s not clear why AirPlay support has been removed from the Netflix app. The feature has been available since 2013 and it was working up until this week. Netflix apps are available on the Apple TV, consoles, smart TVs, iOS devices, and more, so there’s not a real need to use AirPlay to watch Netflix content, but there were instances where it was convenient to use. Netflix has in recent months been making efforts to better protect its content. In December, Netflix stopped allowing customers to sign up for Netflix within the iOS app, and Netflix has never opted to participate in Apple’s TV app, making it unavailable in the “Up Next” feature of Watch Now. Netflix CEO Reed Hastings recently confirmed that Netflix had no plans to be a part ofApple’s TV plans and said that Netflix isn’t interested in offering its content in alternate ways. “We want to have people watch our shows on our services,” he said.